On March 5, 1975, Steve Wozniak attended the first meeting of the Homebrew Computer Club in Gordon French’s garage. He was so inspired that he immediately set to work on what would become the Apple I computer. 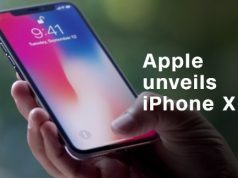 Wozniak calculated that laying out his design would cost $1,000 and parts would cost another $20 per computer; he hoped to recoup his costs if 50 people bought his design for $40 each. His friend Steve Jobs arranged to sell 50 computers to the “The Byte Shop” (a computer store in Mountain View, California) at $500 each. To fulfill the $25,000 order, they obtained $20,000 in parts at 30 days net and delivered the finished product in 10 days. 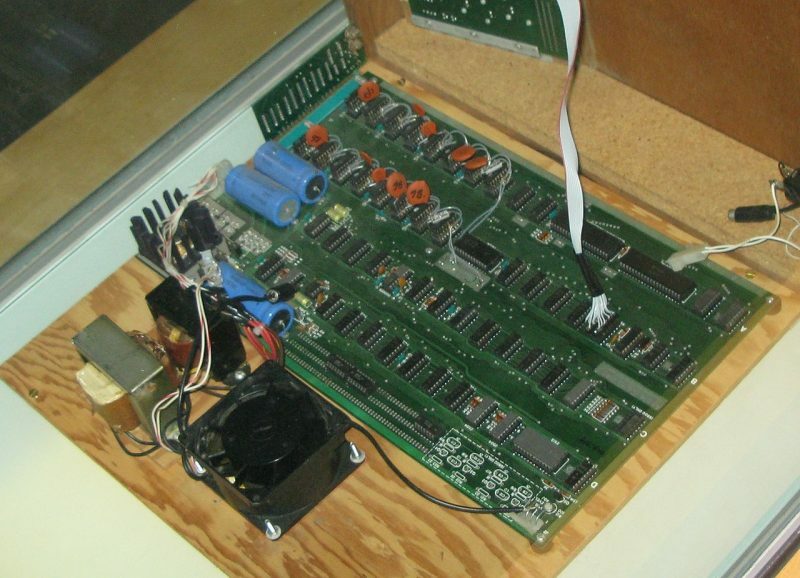 The first unit produced was used in a high school math class, and donated to Liza Loop’s public access computer center.About 200 units were produced and all but 25 were sold during nine or ten months.Unlike other hobbyist computers of its day, which were sold as kits, the Apple I was a fully assembled circuit board containing about 60+ chips. 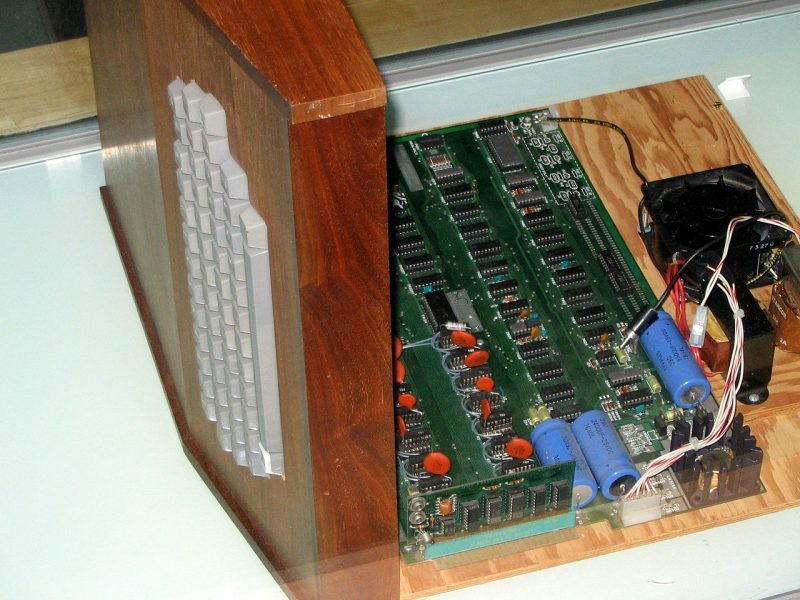 However, to make a working computer, users still had to add a case, power supply transformers, power switch, ASCII keyboard and composite video display. 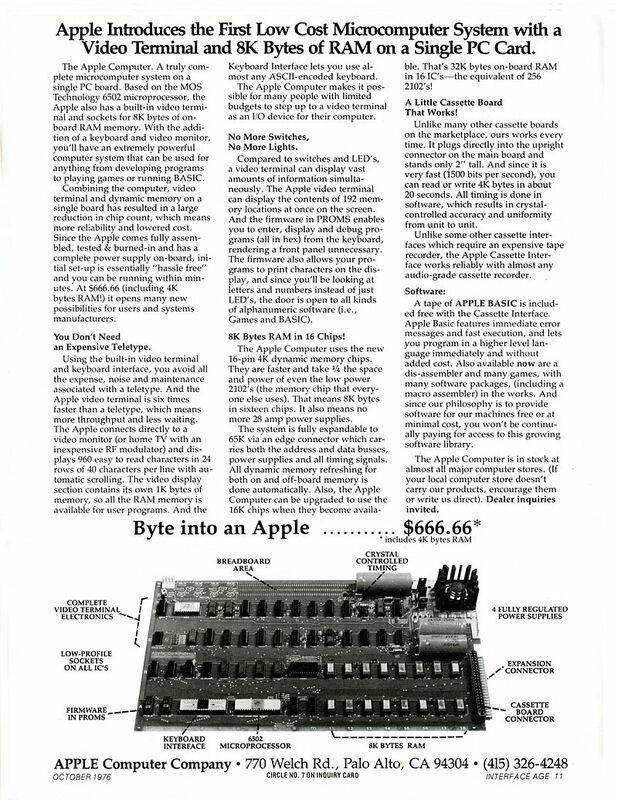 An optional board providing a cassette interface for storage was later released at the cost of $72. The Apple I’s built-in computer terminal circuitry was distinctive. All one needed was a keyboard and an inexpensive television set. Competing machines such as the Altair 8800 generally were programmed with front-mounted toggle switches and used indicator lights (red LEDs, most commonly) for output, and had to be extended with separate hardware to allow connection to a computer terminal or a teletypewriter machine. This made the Apple I an innovative machine for its day. 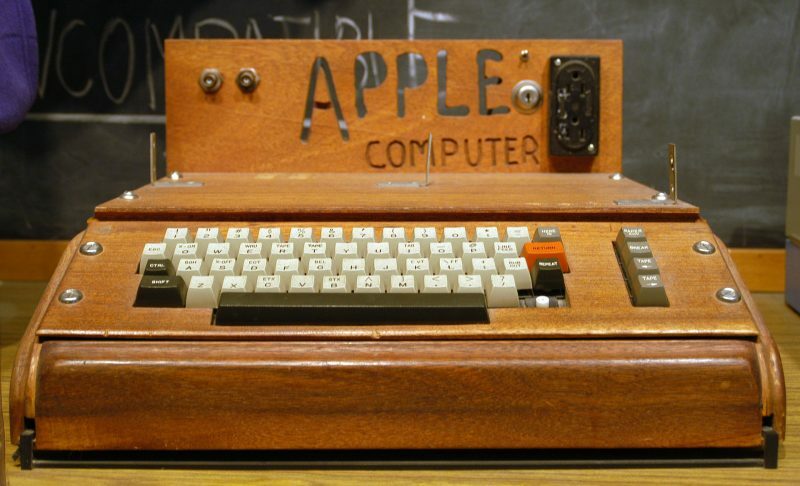 In April 1977 the price was dropped to $475.It continued to be sold through August 1977, despite the introduction of the Apple II in April 1977, which began shipping in June of that year.Apple dropped the Apple I from its price list by October 1977, officially discontinuing it.As Wozniak was the only person who could answer most customer support questions about the computer, the company offered Apple I owners discounts and trade-ins for Apple IIs to persuade them to return their computers.These recovered boards were then destroyed by Apple, contributing to their rarity today. 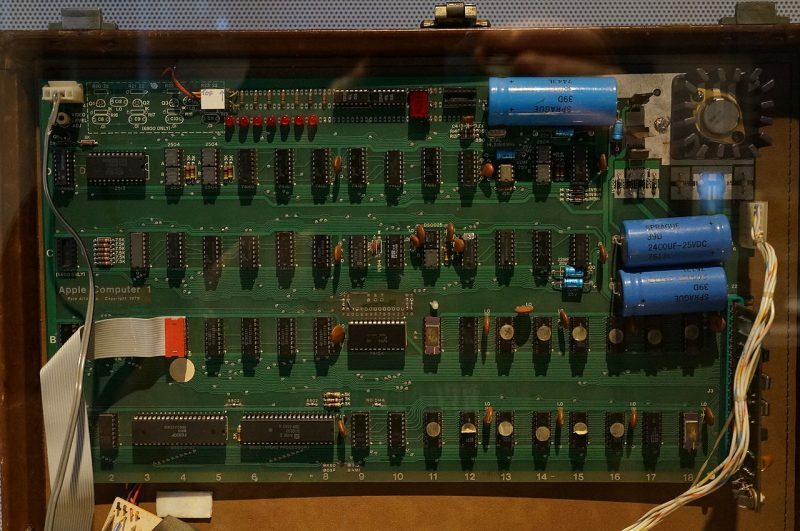 On September 21, 2015, an Apple I bearing the Byte Shop number 01-0059 was listed by Bonhams Auctions as part of their “History of Science and Technology” auction with a starting bid of US$300,000. 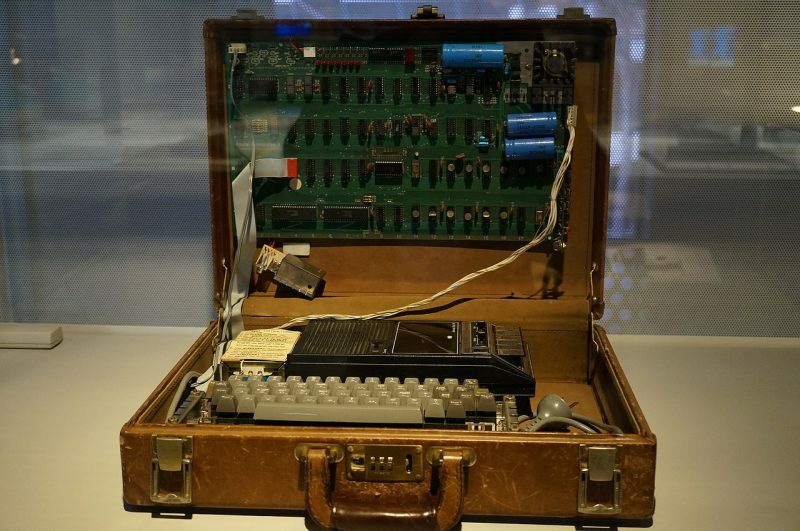 The machine was described as, “in near perfect condition.” The owner, Tom Romkey, “…only used the Apple-1 once or twice, and …set it on a shelf, and did not touch it again.”The machine did not sell.